Brass Combination Lock and hasp Set for briefcases. This replacement brass combination lock set suits many briefcases. 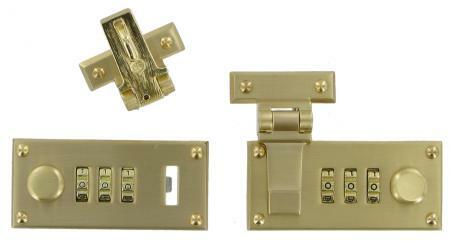 The set includes two locks and hasps and is available in the satin brass finish only. These 11 gauge split rivets are the most common variety used on both locks and hasps for briefcase repairs. They are 20mm long with a shaft diameter of 3mm. They are easily set without special tools the legs are split (bifurcated) and so, with the aid of a flat screwdriver they can be split further apart and then tapped down with a hammer. They are sold in packs of ten.